This Sentence Master English Writing Practice Challenge # 1a has 6 word cards. Using the practice word cards in this challenge format is an excellent method of focusing the student's attention on the 28 to 40 words. Teachers can confirm that the students know the various functions of the words by parts of speech. Any missing information can be an excellent opportunity for teaching vocabulary - language flexibility and context. 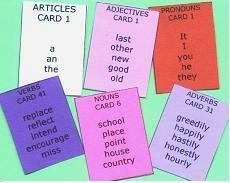 Teachers can use the Sentence Master practice word cards to teach the 1000 most used core English language words and demonstrate the wide variety of context variations. After the students have mastered the creation of many sentences using the original six word cards - you can replace one or more cards, add some cards or start with six new cards. When students need additional complexity and advanced skills practice there are 8, 9, 10, 11, 12, word challenges and the grid quiz. Using the practice word cards can help ESL English teachers focus attention, stage the learning step by step, teach vocabulary, teach context flexibility and variations and even have some fun.